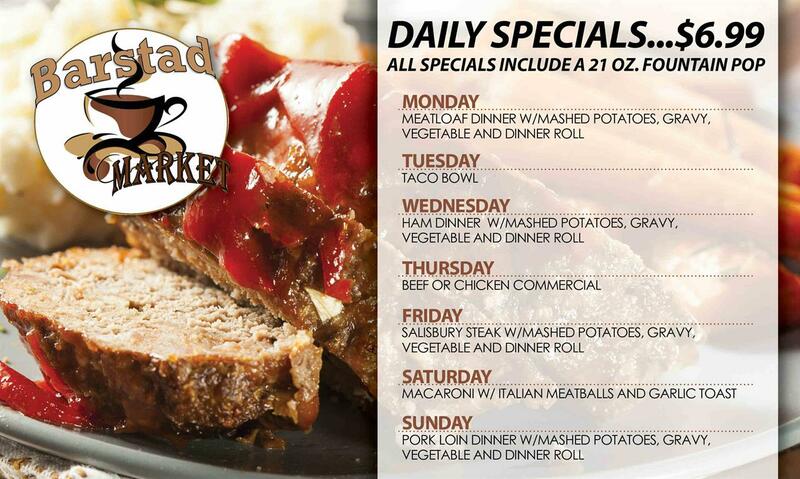 Our delicious daily specials are all $6.99. Meatloaf dinner with mashed potatoes, gravy, vegetables, dinner roll, and fountain pop. Taco salad and fountain pop. Ham Dinner with mashed potatoes, gravy, vegetables, dinner roll, and fountain pop. Beef or chicken commercials and fountain pop. Salisbury Steak, mashed potatoes, vegetables, dinner rolls, and fountain pop. Macaroni with Italian meatballs, garlic toast, and fountain pop. Pork loin dinner with mashed potatoes, gravy, corn, and fountain pop.